In September many Garden plants are flowering and have fresh green leaves. 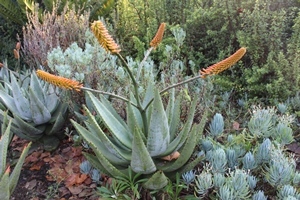 Clivias are usually at their finest from late August to September. We have a large collection of clivias, including some of the rare yellow varieties. They make a spectacular display. 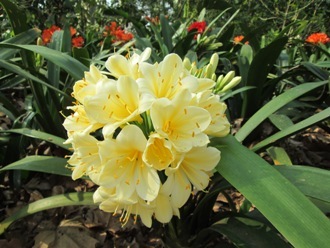 Come and enjoy Clivia miniata, C. nobilis, C. robusta, C. caulescens. Spring annuals and many bulbs, including the blood lily (Scadoxus puniceus), contribute to the colourful Garden environment. Providing a striking contrast to the new green spring foliage and the blue sky are the vivid red and orange flowers of the coral trees, (Erythrina spp.) 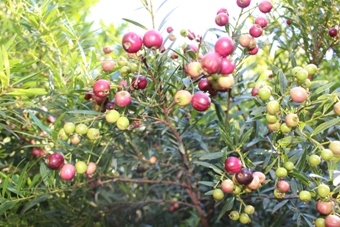 and the Natal bottlebrush, (Greyia sutherlandii), and wild pomegranate (Burchellia bubalina). Weeping boer-bean (Schotia brachypetala) whose abundant nectar attracts large numbers of birds to the garden. It is not only trees and shrubs that are flowering during spring in the garden. 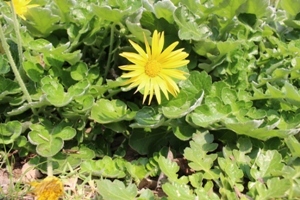 The beautiful, bright yellow flowers of ground covers like (Arctotis arctotoides) also catch the eye. September bells (Rothmannia globosa) are not to be outdone with their short-lived and sweetly scented white flowers; and lookout for sagewood (Buddleja salviifolia) which attracts many insects such as bees, butterflies and birds at this time too. 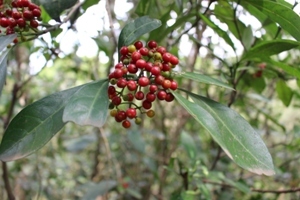 The fruit of the black bird-berry (Psychotria capensis) is also irresistible to birds like Black-eyed and Yellow-bellied Bulbuls, Red-winged Starlings, Robins and Barbets. Bring your binoculars to view the spectacular display during this season when nature’s biodiversity is at its best. 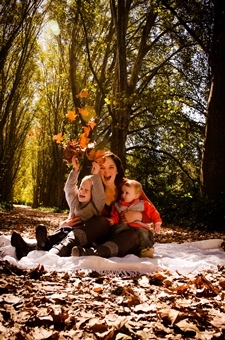 Summers are long, starting around October and lasting until February. The Garden offers a tranquil and shady refuge from the heat. 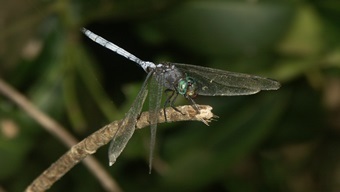 Dragonflies and damselflies are most active in the summer months. Take the Dragonfly Walk and watch these beautiful creatures hover over a pond of pink and blue water lilies as well as over Kingfisher Lake. 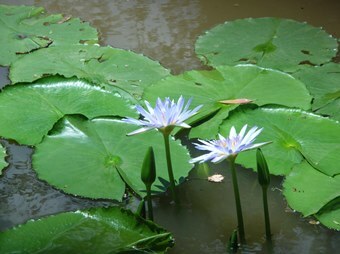 With more than 20 plants flowering, the Garden is a treat for visitors. 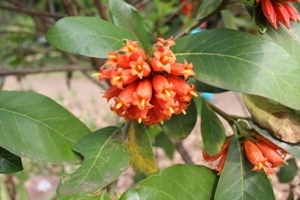 Amongst other plants flowering are the blue felicia, dwarf coral tree, wild pomegranate, Natal flame bush, Plectranthus hybrids, and the trees on the popular Plane Tree Avenue. In December the waxy white sprays of the flowers of the Christmas orchid (Mystacidium capense) can be seen on many of the trees in the Garden. The Pompom tree (Dais cotinifolia) is one of the most beautiful flowering trees during the summer in the Garden, with its pink attractive flowers that look like giant candy floss. Wild gardenia (Gardenia thunbergia) flowers for just a few weeks in mid-summer. It is worth visiting the Garden just to see this spectacular tree. Don’t miss the crinum spp., with their sweet scented white flowers, as they attract many pollinators in the garden. 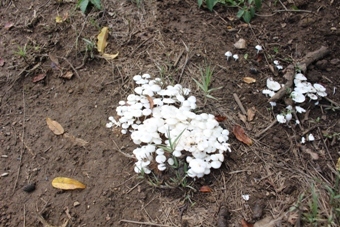 Part of summer’s offering in the garden are various species of mushrooms. Try to spot the different kinds as you walk through the Garden, but tread with caution, as some mushrooms are highly poisonous. Several species of red-hot pokers (Kniphofia spp.) are a feature of the Garden in late summer. 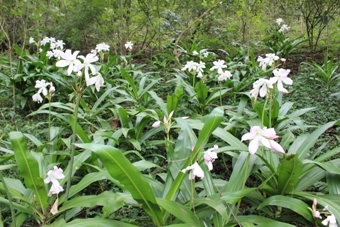 The Midlands meadow, at its finest in December and January, is where you will find many beautiful indigenous grassland flowers such as the Dierama(hairbells) and a variety of South African grasses. It is a beautiful, restful place. 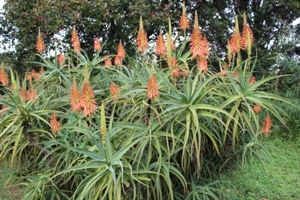 March to May are autumn months in KwaZulu-Natal. At this time the midlands meadow and the grassland beds change colour, with the grasses turning lovely shades of red, beige, yellow, sand and brown. The London plane trees shed their leaves and many happy hours can be spent in the avenue enjoying the autumn colours of the falling leaves. 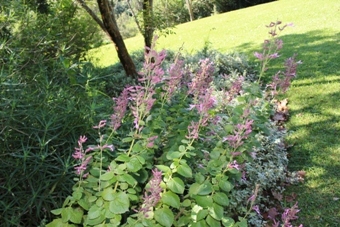 Below them one can take in the hazy beauty of the beds of flowering Plectranthus in shades of blue, purple, and mauve to pink and white. Flourishing in partial shade, these are marvellous plants for the home garden. The Purple haze produces an intense show of deep purple flowers, while very little is in flower in the garden. Syncolostemon obermeyerae, Cyanotis speciosa, pink sage, Kniphofia and Watsonia species give colour and attract birds and butterflies in the garden. Between late April and Mid-May, the beautiful Cordia africana presents the garden with rare and beautiful white flowers that resemble snow as they fall. This tree is known for its strong wood. It was used to make the Akan Drum, which is the oldest known African-American object in the world and is now displayed in the British Museum. 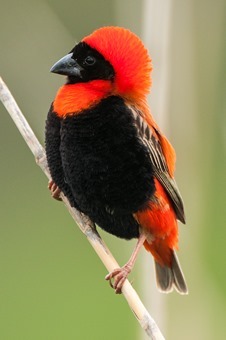 A walk in the Pondoland Garden presents visitors with a captivating view as birds feed on the red to purple roundish fruits of Syzygium pondoense. Birds including cormorants and herons are to be noticed during this time at the Clivia Dam with the cormorant performing rare displays of swimming skills as it hunts for fish underwater. The swamp cypress takes on its fiery autumn colours which lend a certain uniqueness to sections of the Garden. Do not call fire department, the trees are not on fire! It’s just the leaves of the swamp cypress which resemble fire when observed from afar. Winter (June and July) is when the Garden’s many deciduous trees can be seen to best effect. 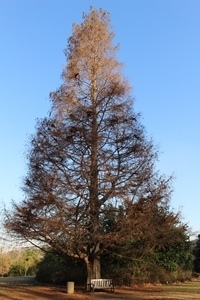 With most of their leaves gone, the spectacular shapes and designs of the stems, trunks and branches are clearly visible. 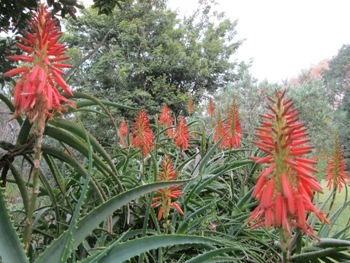 Aloe species and wild dagga (Leonotis leonurus) flower in June and July, filling the Garden with splashes of orange. Winter is an excellent time to enjoy the Garden’s indigenous forest. It is easily accessible, with a network of paths that wind into the hidden parts of the Garden. Visitors might just spot the small wild antelope, the blue duiker, hidden among the trees. A forest stream sets a tranquil mood as the water flows down to Kingfisher Lake. A captivating view of Plane Tree Avenue can also be seen from this point. Night walks are one of the special events that take place in the Garden during this time of the year, with star gazing, moonlight and forest exploration being the key themes.